On Thursday (6/7/12), the Food and Agriculture Organization of the UN (FAO) released it’s indices for food prices in international trade. Most of the news coverage was upbeat because May showed the largest drop in some time. For instance, the allAfrica website had a headline, “FAO Food Price Index Drops Sharply.” It was a 4% drop; however that comes after several months where the index stayed flat and failed to show the sort of major correction that occurred after the last spike (2007-9). Even with the drop in May, the index is still nearly as high as it’s highest level in that previous spike. Perhaps I’m doing some “glass half full” thinking, but what concerns me is that May’s drop comes mainly from changes in only two of the components. There was a serious drop in the dairy component of the index which really dominates the overall story for May (see graph below). 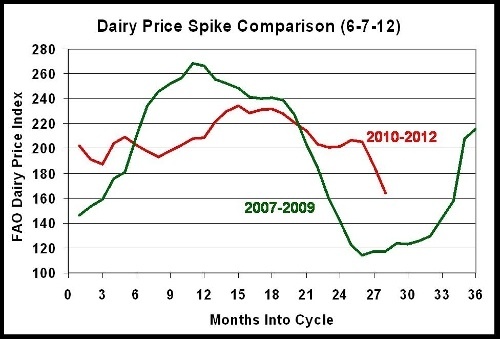 Indeed, the dairy index is dropping at exactly the same rate as it did in the last correction – just a few months later. Some news sources highlighted this contribution, but not most. 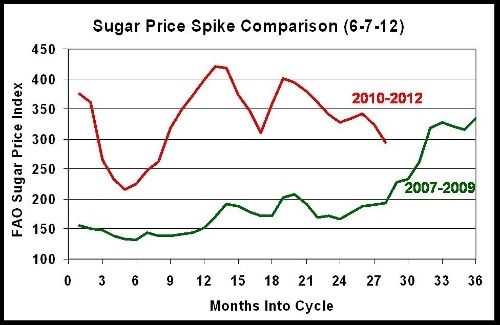 Sugar also dropped quite a bit over the past two months, but neither sugar or dairy are “typical” in terms of their pattern vs other important commodities. 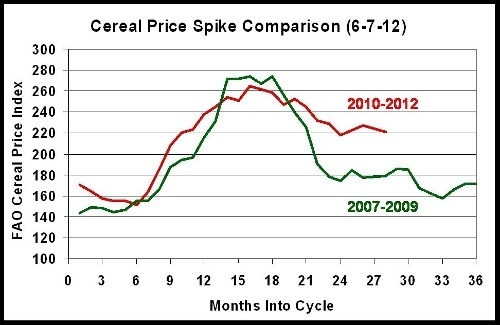 What concerns me is that the cereals index (see below) is so stubbornly high. It’s drop in May was really quite insignificant and does not even undo the increase that occurred in April. 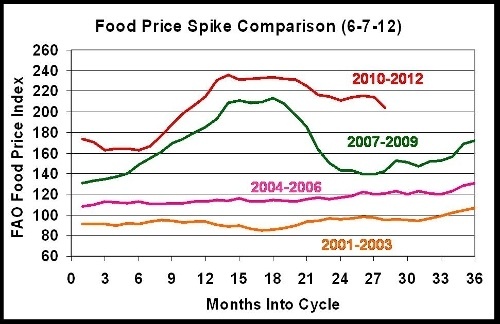 These are prices that make life very difficult for grain dependent, poor nations around the world. 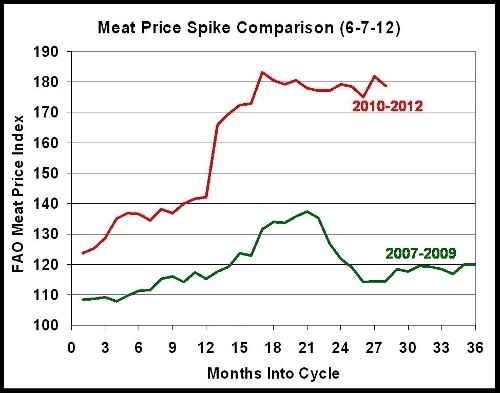 The meat index, which exhibited the most dramatic spike in 2010-12, shows little sign of correction at all. 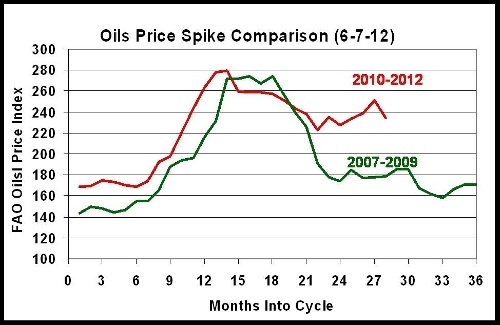 The oils index dropped some in May, but once again not enough to erase the increases that have occurred over the last 6 months. Many who have written about the latest index data do make a very good point. All it would take was news of some major weather issues for the 2012 crops that are now growing, and May’s progress could easily be reversed. Are the cereal issues related to both USSR’s drought in the growing regions and Pakistan’s floods last year which took out the grain harvests? Or not? I am aware that the high price of cereals are an issue, farmers here are trying to harvest more locally grown fodder each year to over winter their animals and augment the grain feed. Its circles and loops all over the food producing world, isn’t it? You grow what you can and hope for the best, but that is not a sustainable solution either, not long-term. This article sure made for interesting reading though, thank you. I think you are right that the weather issues in Russia and Pakistan are part of the story. We won’t know for sure until we can look back over 10 or 20 years, but it is definitely possible that the frequency of disruptive weather extremes is the result of climate change. Now that global food demand is so high, poor harvests anywhere can strain the system.